Picking up some ice kayaking near Valdez, Alaska in 2011, during a 140-mile trip from Valdez to Whittier. 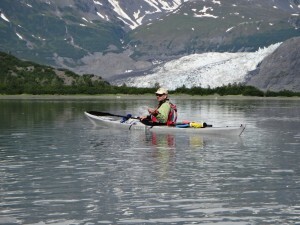 I’m an ACA L-5 Advanced Open Water kayak instructor, L-4 Instructor Trainer aspirant and BCU 4-star paddler. I’ve been an instructor since 2006 and spend most of my paddling time in the surf and more dynamic environments. I love teaching/coaching and helping students grow their skills and confidence. I’ve been fortunate to take advanced training from some of the best coaches in the world, and have paddled in Wales (UK), Alaska, Baja and Nova Scotia in addition to many spots in the southeast. Thanks for visiting, and please contact me if you have any questions or find me on Facebook. Great Chesapeake Bay and similar watercolor art. "I have taken classes with many different instructors, including some of the "big" names in the business. Without a doubt Tom's teaching style, patience and skill have had the biggest effect on my progress as a paddler."